Tonight, we will continue our series, "Exploring the Dark Side of Western New York," where Ghost and his haunted friend What a Witch will visit or explore an area, place or attraction in western NY that has a dark, spooky past, or lends itself to the darkness we long to explore. For this installment of western NY's dark side, we come to Frightworld Screampark, WNY's premiere haunted house attraction. This year, we again sat down with Stephen Szortyka, GM and Director of Operations for Eeire Productions and Frightworld America's Screampark, to talk about what makes Frightworld so widely popular-- and wildly unique-- in western New York. Stephen, thank you so much for sitting down with us to talk about Frightworld this year. Ghost and WhataWitch are dying to know…. With our transition from the Northtowns to Depew, our customers can expect all BRAND NEW floor plans as well as a brand new attraction: INSANITY. Frightworld is in a different location this year. What advantages do you see in the new space? We are really excited about the new location! We are back in Depew in a 70,000 square ft building. It’s a great area! We have more space to make our attractions larger than before and more space to bring fear to our customers. Its been a great year thus far! Your haunted houses are huge, and massively detailed. Eerie Asylum alone is so intricately detailed. When do you start planning for your setup each year? That’s a great question! We spend all year brainstorming different ideas and concepts that will intrigue our fans. We are constantly trying to impress our fans, as well as ourselves! We are really excited because we were able to expand our floor plans for each attraction this year! Some haunts are 50% larger than they were last year! How long does it take you to build the houses, and how much help do you have in putting it together? Our build crew and set dressing crew are extremely talented! Depending on the length and size of the attractions depends on how much time. Of course, we would love to spend months detailing an attraction, but that’s not feasible. Generally a house will take 2-3 weeks for build and 2-3 weeks for set dressing. It seems like every few years another haunted house attraction pops up in WNY. How do you stay ahead of the competition and what do you think sets your attraction apart from the others? I am confident in saying that we uphold a reputation of a very detail oriented event and our fans expect that every year. Making sure that our event holds up to that reputation is our main focus, and making sure that our scares and fears are current and up to date! Like I've said before, it takes months of preparation and research to understand what works and what doesn’t work. Congrats to the new comers to the industry and we always wish them best of luck in business! Do you frequent haunted house conventions or attractions in other states to keep up on trends in the industry? Absolutely. One of the biggest conventions for the haunted attraction industry is held in St. Louis every year. Transworld Haunt Show brings vendors from all over, bringing the newest sets, props, costumes, and technology. We always try to attend other haunted attractions but generally, we do not get the time as our favorite Halloween season is making sure our event is the best experience for our fans. What is the creepiest or favorite acquisition you have made for your screampark? We like to give the persona to our fans that once they walk through our doors, they forget that there is a real world out there, and they are now consumed in Frightworld. Once our fans walk through the door, it’s a whole different world. From the main floor to our bathrooms, you will be engulfed in fear and the unknown. What kind of training are your actors given each year? Each year, our actors attend a 4 hour "Boo School" where they are put through a rigorous training seminar. They partake in hands on training within the attractions. They understand Fear, the underlining reason why society gets scared. Different techniques, different movements, customer and actor safety, and customer flow within the attractions. Frightworld’s reach extends beyond WNY, having notably been featured on the Travel Channel. Where are some of the furthest locations your guests have come from? Our furthest fans have come from as far as Hong Kong and Taiwan, CRAZY, I KNOW! Majority of our customers are from the Buffalo area, Syracuse, Rochester, Canada, and Pennsylvania. We have been lucky enough to be voted #1 haunted attraction in the Northeast and #1 in Buffalo, NY. Our Eerie State Asylum was actually voted #1 best attraction maze as well!!!! As well as being featured on the Travel Channel we were also voted many other awards! It feels GREAT to see all of our hard work, pay off. Like many people, we were wrapped up in the hysteria that was HBO’s “True Detective” earlier this year. The show was a modern horror and crime mystery that drew largely from Robert Chambers’ 1895 horror book “The King in Yellow.” So, let’s talk about Carcosa from the show. The moment we saw the creepy underground lair in the show’s finale, we thought it would make for a spectacular haunted house experience. Any chance we will ever see this—or something like it’s ruins-- in the future? That’s a touchy subject. We would LOVE to mimic some of these great shows/movies that are coming out, but we also want to make sure we are original in everything that we do! Our fans love our work, and we want to make sure we withhold that reputation! Generally, we stay aware from mimicking shows and movies! Frightworld seems to always fit the right balance of different kinds of horror. Unlike a number of horror attractions, you seem to understand that one cannot live on shock and gore alone, and feature a balance of more modern horror and the appeal of the seemingly older, as with the creepy old asylum. Is this intentional? Yes, and very good observation! We have 5 differently themed attractions! We want to make sure that our fans are scared. Sometimes, an asylum may not scare a customer, but I can guarantee you that they fear something in one of our other attractions! We want to make sure that we have the ability to appeal to a wide array of fans. Like you said, we need to make sure we have balance. Many people perceive people in your industry as being “dark” or “morbid.” What response do you give people who say such things, other than “Thank you”? Many of us are just as normal as the person who is saying that. With normal day time jobs, graduate and undergraduate students as well as very talented industry professionals. There is a business side to this event that takes an extensive amount of time and expertise, between marketing and advertising to managing over 60 employees as well as our digital and media designs, commercials, both TV and radio production. We often read in the paper about attractions like this- combined with the raging hormones from groups of teens and preteens- causing a bit of a disturbance of the non-paranormal kind. What kind of security measures do you have in place to keep your demons…errr…customers…exercised? Customer safety is our main focus! The whole event is designed around making sure our fans are safe. We employee Cheektowaga uniformed police officers to patrol our event. We are both dying to know if those claustrophobic balloon passages are part of your exhibit this year. They scare the living daylights out of us in a good way and WhataWitch is eager to experience them again… we all know its bad luck to disappoint a witch, Stephen. 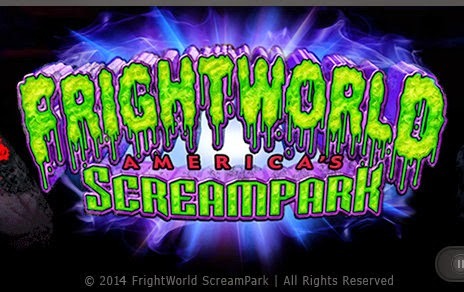 All Photos Copyright 2014 Frightworld Screampark.